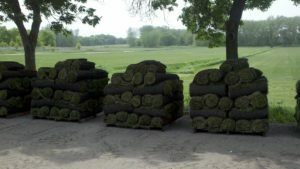 About HD Sod, Inc. ~ Your friendly Twin Cities sod supplier..."Want some good grass?" HD Sod, Inc. started in 1979 but did not get its name until 1983 as Harley was also working for his parents’ farm. Getting married to wife Debi in 1981 and buying 10 acres to work with Harley was now able to do what he loves: raising and growing sod. Debi helped while raising two children and working up a clientele to keep them busy. They work many hours during the summer months. 2011, Harley and Debi’s daughter started working for the family farm. Now owning 155 acres to grow the GREEN, HD Sod provides their community and trusted landscapers with high quality sod for the best lawns. Measurements: Each roll covers 13.5 sq. ft. - they are 24" x 81"
The sod we grow is a blend of five different Kentucky bluegrasses. It is shade tolerant, disease resistant and is cultured. Though our sod is shade tolerant, it does need at least 60% or 4 hours of sun per day. HD Sod grows its sod on peat or mineral bases. Peat is an organic lake bottom type base and the mineral is a sandy clay type base. 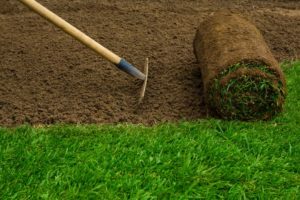 If you have any other questions about our sod, please give us a call. Saturdays: 8:00 - 12:00 p.m.
© 2019 HD Sod. All Rights Reserved.